After successfully vaccinating his children against smallpox, Dr. Benjamin Waterhouse sent a copy of his pamphlet A Prospect of Exterminating the Small-Pox (1800) to Thomas Jefferson, then Vice-President of the United States. 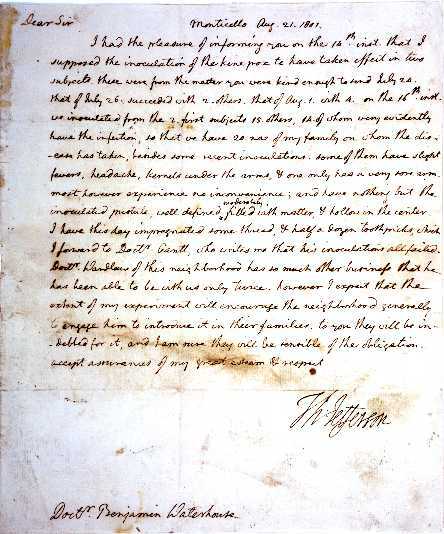 As this letter from 1801 testifies, some vaccine matter from Waterhouse was used by Jefferson in experiments with members of his family and household at Monticello. 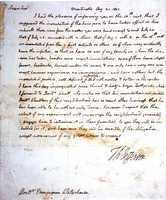 Jefferson, Thomas, 1743-1826 , “Autograph Letter Signed from Thomas Jefferson, Monticello, Virginia, to Benjamin Waterhouse, Cambridge, Massachusetts,” OnView: Digital Collections & Exhibits, accessed April 22, 2019, https://collections.countway.harvard.edu/onview/items/show/6443.